For the Mahāparinirvāṇa Sūtra, a text of East Asian Mahayana Buddhism, see Nirvana Sutra. 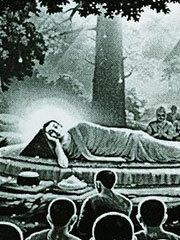 The Mahaparinibbana Sutta is a Buddhist sutra in the Digha Nikaya of the Tripitaka. It concerns the end of Gautama Buddha‘s life. This sutta gives a meticulous account of the last year of the Buddha’s life. Two things about this sutta are of special interest: the biographical details of the Buddha’s life, of which this is the longest and most coherent account in the Pali Canon, and the doctrinal details to which the sutta refers, implicitly or explicitly.